Glentoran manager Gary Haveron. Pic by Pacemaker. Glentoran manager Gary Haveron is open in his admiration of Coleraine’s progress - even if he is aiming to derail the league leaders this weekend. Haveron accepts expectations at The Oval, given Glentoran’s history as an Irish League giant, dictate additional pressures but he draws parallels with his development goals and the current Coleraine model. The greater burden for immediate and lasting glory a Glens manager must embrace may prevent a similar growth period over a number of seasons of learning lessons. But Haveron’s bid to rebuild Glentoran’s reputation is developed around similar traits of a slow and steady off-the-field approach alongside fast-paced football after kick-off. “I’ve a lot of respect for the job Oran Kearney has done at Coleraine and the way in which he has been given time to build something,” said Haveron. “It’s a testament to what can happen under those circumstances and we are trying something similar within the expectations you face at Glentoran. “Coleraine are a few seasons down the line compared to us but, certainly, the aim was to focus more on youth in the summer. “That is in part down to finances but also what we believe in. 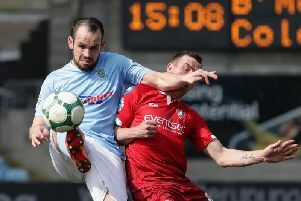 “Bar a few people, most players would not have 50 Irish League appearances yet and you have to go through that period of ups and downs as young players acquire experience. “We are missing some key players and those absences do hurt us at the minute, although credit to Coleraine for coping so well with problems on that front. “But we can also see our squad developing the maturity and strength, physically and mentally, to go alongside the ability. “We face Coleraine to get a win and that will always be the aim of any side I send out. “One advantage Coleraine can enjoy is the benefits of resting players in the midweek cup tie. Haveron’s appreciation of his opposite number is a respect between managers shared by Kearney. “I think the main difference this season is that Glentoran now have two recognised strikers in Robbie McDaid and Curtis Allen,” said Kearney. “Gary has been more adventurous in that regards and that partnership will only get better. “We know that we will be in for a stiff test. “The games between the two sides are genuinely quite tight and it was the same earlier on in the season. “The previous encounter was a tough tough day for us. Kearney’s immediate focus on the weekend test continues the policy of the Coleraine boss to centre efforts only on the challenge at hand despite such a dream start to the Danske Bank Premiership. He could turn to recent arrival Martin Smith, who has been signed in the aftermath of injuries to Eoin Bradley and Brad Lyons. Smith has been on the books of Sunderland and Kilmarnock. “This game is simply about getting another three points and we have been driving that hard into the players,” said Kearney. “I would have taken a point against Cliftonville after the run they were on and our injuries. “We need to be more proactive at home and we have had a proud record for the last 18 months or so. “We will have Martin available for selection as he has been training and played two 90-minute matches. “The only thing is a lack of match fitness, it is great to have him in the squad.